Willie's Hog Dust is a South Carolina based company founded in 2009. Like most BBQ start ups, Willie began cooking regularly at home and experimenting with his own flavor combinations. Years of testing led him to develop his Hog Dust rubs formulated primarily for pork and chicken. To compliment his rubs, Willie also developed a tangy sauce that blends the various tomato, mustard and vinegar sauces found South Carolina. Willie's Hog Wash is unique in that it really can't be categorized as either a tomato, mustard or vinegar sauce. It's truly a blend of all three. Hog Wash is dark red in the bottle. The sauce is on the thin side, but not nearly as thin as traditional Carolina vinegar sauces. Coarsely ground dark spices can be seen scattered throughout the sauce. It pours quickly as the bottle has a wide open mouth. While Hog Wash evokes many of the flavor attributes that I became accustomed to while living in the Carolinas, it definitely deviates from tradition. Thanks to ketchup and additional sugar, the sauce has a sweeter profile than standard vinegar sauces. That's just fine with me. I love using sweet ingredients to balance the vinegar tang. The sauce also finishes with just a touch of heat thanks to the inclusion of cayenne pepper sauce. Anytime a sauce with Carolina roots comes my way, I'm compelled to use it on smokey pulled/chopped pork. I poured an entire bottle of hog wash over a large mound of hickory smoked pork shoulder that I cooked for the holiday weekend. 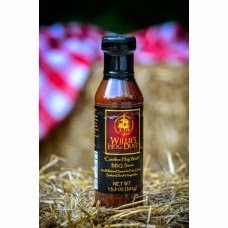 Willie's website suggests a variety of uses for the sauce, but I can't think of better use than pairing it with smoked pork. The thin sauce covers and penetrates the meat perfectly. The tangy flavor is a natural compliment (enhancer?) to the mild, smokey pork. It's probably thick enough to use as a finishing sauce for ribs and chicken, but it's tailor made for pourin' or dippin'. I've tried my share of sauces from the Carolinas. Willie's Hog Wash is the real deal. It belongs right along side of other top shelf vinegar blends. It's sure to please Carolina traditionalists and maybe even convert a few Yankees. Willie's Hog Wash and other products can be purchased here. 0 Response to "Willie's Hog Wash"